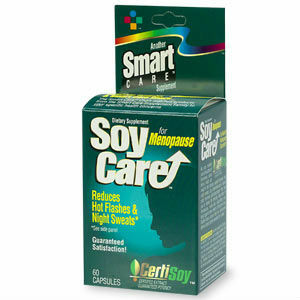 Soy Care is made using organic and GMO-free soybeans. Soy contains isoflavones, which are natural plant hormones. Isoflavones compensate for the drop in human estrogen production during menopause and reduces the uncomfortable symptoms that causes. This supplement reduces hot flashes, night sweats and vaginal dryness and atrophy that occur post-menopause. Soy also keeps the cardiovascular system healthy. Women should take 2 capsules a day – one in the morning and one at night. Isoflavones last in the body for about 8-12 hours and so two doses maintain a proper level of isoflavone in the body to take care of both day and night symptoms. Not suitable for people who are allergic to soy. This supplement should also not be taken along with Hormone Replacement Therapy. Ingested isoflavones are only active in the body for 8-12 hours after which they are broken down and excreted by the body. Since isoflavones only replace natural estrogen in the body to reduce symptoms, they are only helpful while they are present and do not have any lasting benefits. Price for a 60 capsule (one month supply) pack is $12.99. An additional 10% discount is available if you opt for the auto-reorder option. The product comes with “Guaranteed satisfaction” written on the packaging and is backed by a 30-day return policy offered by the company. The soy used is also guaranteed to be potent. Soy isoflavones have been found to be effective in reducing the symptoms of menopause and are a commonly used ingredient in menopause supplements. Since the main ingredient is soy, it may cause allergic reaction in some people and should be used carefully. Jackie Horowitz	reviewed Soy Care	on September 3rd	 and gave it a rating of 2.5.